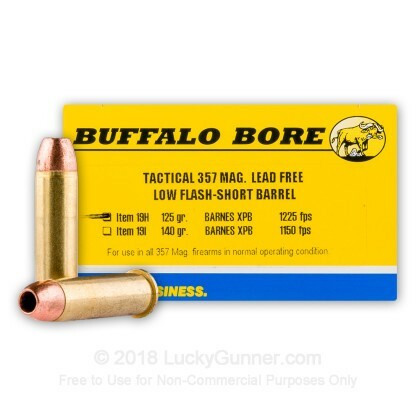 If you are looking for a powerful 357 Mag cartridge with lower recoil this Buffalo Bore Tactical 357 Magnum XPB HP Low Flash Short Barrel ammunition is for you. Made with a special powder to decrease the intensity of the flash, this round can be used in low-light situations and won't blind the shooter. As many situations that might require self-defense do occur at night, this is a great choice for your short barrel revolver, and with the 125-grain XPB Hollow Point bullet, you can be confident your shots will count. 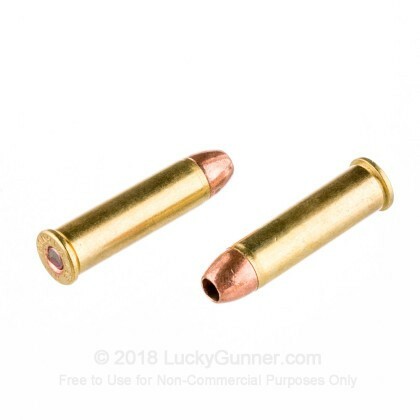 Developed by Buffalo Bore in conjunction with Barnes Bullets, the XPB Hollow Point projectile is a lead-free, solid copper bullet, with the signature hollow point tip designed for consistently great expansion for your self-defense needs. This particular round is loaded with low-flash powder and is designed for short barrel revolvers and therefore is loaded lighter to reduce recoil. 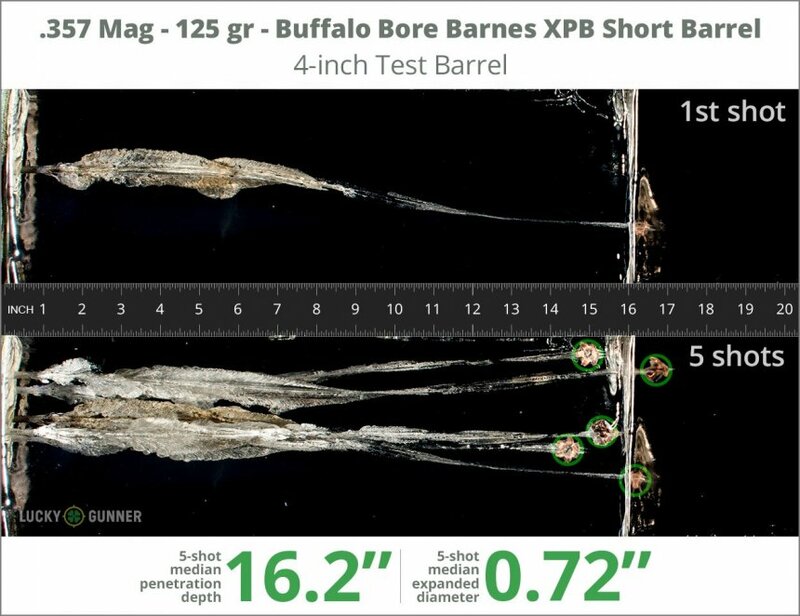 Made in Montana, Buffalo Bore Ammunition is made in Montana. 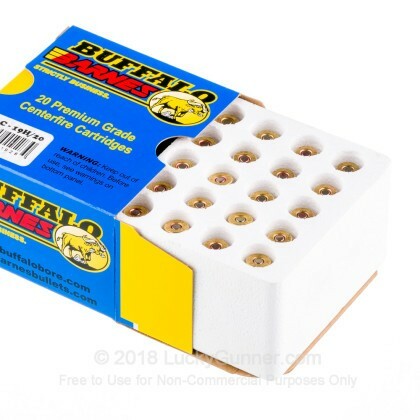 They produce handgun ammunition like this for self-defense and hunting, and they also produce specialty ammo for big game hunters in many rifle calibers. 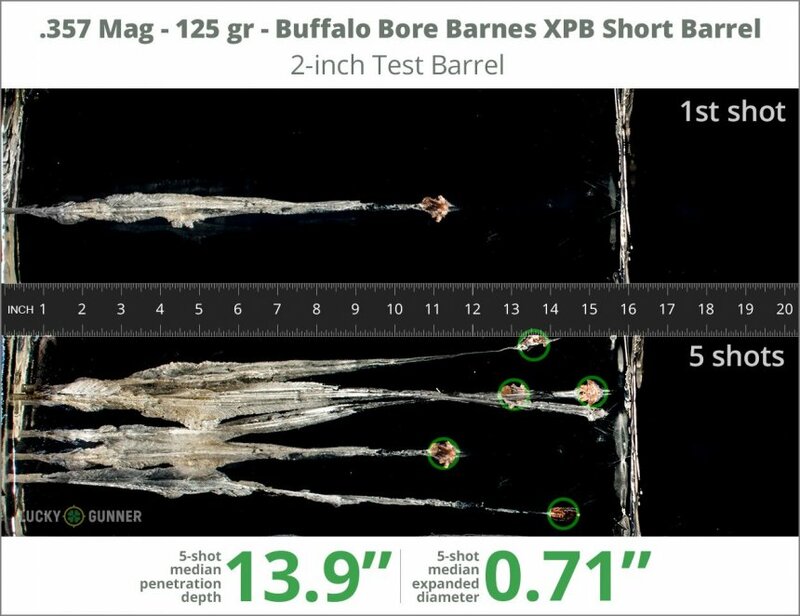 After firing five rounds of Buffalo Bore 125 gr Barnes XPB Low Flash Short Barrel from a Kimber K6s into synthetic ballistic gelatin from 10 feet away through four layers of fabric to simulate clothing, we then measured the expansion and penetration of the bullets for this .357 Magnum load, which you can see in the chart below. 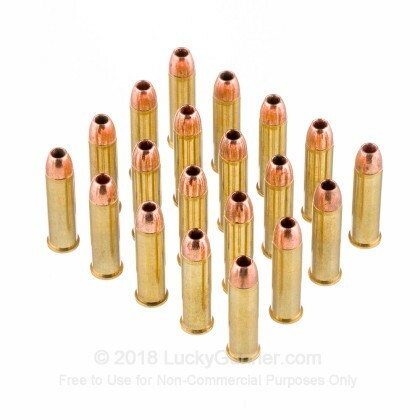 0.75" This ammo: 0.71" Min: 0.35" Median: 0.55" Max: 0.75"
13.9" 0" 9.2" 17.3" 41.7" This ammo: 13.9" Min: 9.2" Median: 17.3" Max: 41.7"
After firing five rounds of Buffalo Bore 125 gr Barnes XPB Low Flash Short Barrel from a Ruger GP100 into synthetic ballistic gelatin from 10 feet away through four layers of fabric to simulate clothing, we then measured the expansion and penetration of the bullets for this .357 Magnum load, which you can see in the chart below. 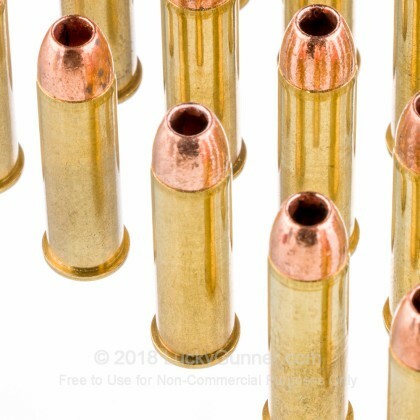 0.75" This ammo: 0.72" Min: 0.35" Median: 0.55" Max: 0.75"
16.2" 0" 9.2" 17.3" 41.7" This ammo: 16.2" Min: 9.2" Median: 17.3" Max: 41.7"
We don't have any reviews yet for this particular .357 Magnum ammo from Buffalo Bore. 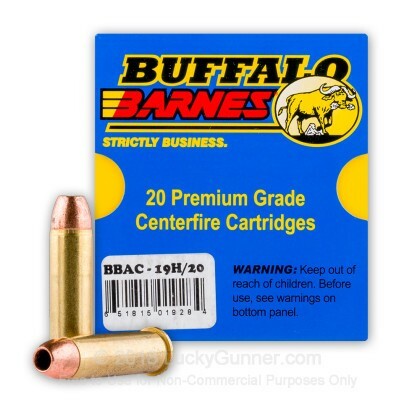 If you'd like to be the first to review this particular .357 Magnum ammo from Buffalo Bore, fill out the form below.